*Use good-quality chocolate such as Scharffen Berger and Valrhona. ** Nearly any ingredient can be steeped in cream to give the truffles a mysterious dimension of added flavor. A few favorites: 2–3 earl grey or chai tea bags; a few cinnamon sticks or cloves; star anise; a few teaspoons of freshly grated ginger; a dash of cayenne pepper flakes; a few teaspoons of orange zest. ***Use Grand Marnier, Kahlua, Brandy, Whiskey or any kind of liquor that complements your primary flavoring. You may also use 1–2 teaspoons of extracts such as vanilla, peppermint, or orange. Chop chocolate into small (1/4”) pieces using a sturdy chef’s knife or food processor. Place chocolate in a medium, heat-proof bowl. Remove from heat and immediately add the solid flavorings of your choice. Allow to steep for 20 minutes. Strain out the flavoring ingredients and return the cream to the stove. Bring back to a boil, remove from heat and immediately pour it over the chocolate. Whisk in liqueur or flavoring. Pour into a shallow pan and refrigerate for a minimum of two hours. Using a small ice cream scoop or melon baller, scoop balls of ganache. Smooth the balls by rolling between palms. Roll balls in cocoa, shake off excess and refrigerate. 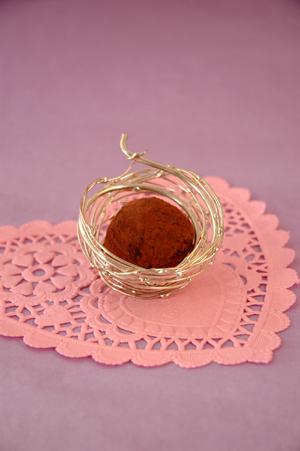 Truffles can be stored, covered, in the refrigerator for up to 2 weeks. For easier handling, serve in pretty paper candy cups. Preparation time: Approximately three hours including downtime. A Barbara Adams Beyond Wonderfulrecipe by Baking Expert, Catherine Christensen.